My Black & Decker cordless mower and weedwacker are the best things since sliced bread. Since we had visitors I had little time to mow and trim the yard. The lawn had grown for a little more than two weeks so this morning I decided to have at it. The wacker cleaned up the edges in no time flat. The mower cut the entire 70' by 240' backyard without even breathing hard. Kudos to B&D for some fantastic products - highly recommended for those of you who don't want to deal with gas implements. You may recall I mentioned adding a side bed in the backyard next to the patio. I planted two dwarf oleanders and a thrayllis along with a few stray elephant ear rhizomes. Here's what I learned over the summer - the elephant ears shot up like Jack's beanstalk and covered the dwarf oleander. That wouldn't have been that big of a deal except that by shading the oleanders, the little caterpillars that love to chew on their leaves got away with murder. Those babies stripped one of the oleander shrubs like nothing I've ever seen. Consequently, I'll be relocating one of the oleanders and a couple of the elephant ears. The cherry tomato plant that kept our squirrel friends fed and us entertained with their antics has passed on. Somewhere in all the guest madness the tomato plant did not get watered regularly and withered away. Of course, you'd of thought that Mr. Squirrel would have brought out his own watering can to keep the supply coming but I guess he needs some gardening lessons. The same thing sort of happened to those hibiscus cuttings I was bragging about. Of the 9 started, about 4 are still living. Those babies will be planted this weekend right after Katrina's bands move through. The moorhens residing in the pond behind our home have had three new chicks. 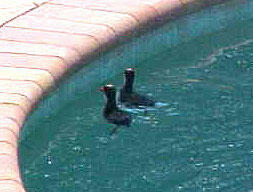 I guess two little guys got tired of their water because they have taken to swimming in our pool. 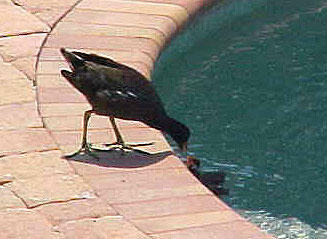 While they're lounging in the water, Mom and Dad provide snacks! Finally, an update on the senior pups I told you about. Pepper and his little buddy Poncho have been adopted together and are as happy as they can be in their new home. Their new mom had just lost her little dog to old age so it was just fitting that she gave these two little guys a place to call their own. Thank you, Linda, for taking them into your heart. Tasha and Adrian have also found wonderful loving homes. Both are doing well and very happy. There are always more out there waiting so please keep seniors in mind when you think of adopting. I have also started publishing a newsletter for Lost Angels so if you are interested in being included on the mailing list, please send me your email address. That's all for now and I think that's plenty for two weeks! Happy Gardening.